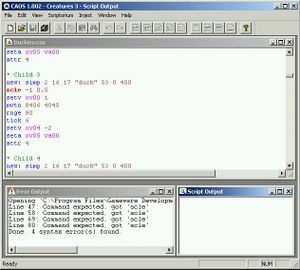 The CAOS Tool is a Windows program developed by Creature Labs to write and inject CAOS code into the Creatures 3/Docking Station engine. It was the tool used internally by Creature Labs when they made the games, and was originally sold through CDN but is now a free download. You need to use the registration key provided on the official website to run the tool. If you are using Creatures Exodus, you may need to install the Creatures Remastered Patch so that the CAOS Tool can talk to your game properly. Features include that it is fully syntax aware and will display CAOS errors in red. The error window will give you clues as to why your code failed. All cos files can be formatted and are colour coded to improve readability. The CAOS tool will let you inject particular scripts directly into the game. It will let you browse the scriptorium of the game and view particular scripts. Free text editors can also work with COS files, and some have CAOS highlighting tools available. Common Errors at an archive of the CDN. This page was last modified on 10 September 2018, at 20:30.